You’ll find your flat iron steak among the slightly more expensive cuts of beef, but don’t let the price put you off this amazing opportunity of dining so well in your own home. Did you know you can dip those gorgeous sweet potato wedges into the dressing too? We highly recommend it! But back to the steak for a moment, for this salad is nothing without it. If you don’t find it labeled as “flat iron steak”, try searching for a “top blade steak” instead. Best not cook it beyond medium if you are seeking the ultimate satisfaction in flavor. Once you’ve sampled this special cut of beef and aim to make it a recurring factor in your meal prep, may we also suggest marinating it in this citrus marinade or rubbed with lemon pesto and tossed on the grill? If by chance you have stocked up on avocados and don’t know what to do with them, there is a Keto avocado green smoothie that always hits the spot. Grill 4 to 5 minutes per side, or until desired doneness. Transfer to a cutting board, let the steak sit 4 to 5 minutes, and slice. Make the dressing by adding all the ingredients to a food processor, season to taste, and blend until smooth. In a salad bowl combine the spinach, bell pepper, radish, cucumber and tomatoes; toss gently. 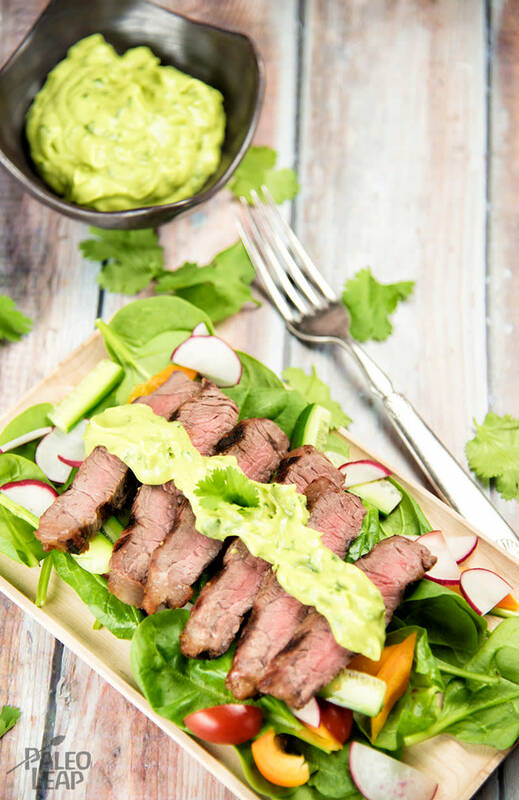 Serve the salad with sliced steak and avocado dressing drizzled on top.